This might be news to some of you who don’t follow me on social media, but I just started posting my novel to Wattpad. It’s called BLOOD AND WATER, and it’s about a 17 year-old named Jay Harris who is living in the midst of a deadly pandemic. It’s the first time I’ve posted a work-in-progress to Wattpad. When I started, I wasn’t sure what to expect, but now, I adore it. Let me tell you why you should post your novel to Wattpad: whether it’s finished or not, it’s a great way to get free feedback on your writing. Wattpad is an active community filled with tons of people who love engaging with writers. If you’re worried about receiving criticism, you can relax – the majority of comments made on the site are overwhelmingly positive. Speaking from personal experience, it’s tough to run into someone who’s outright rude or disrespectful. Another great thing about posting your novel on Wattpad is that it motivates you to keep writing. When readers are asking for your next update, you feel compelled to write it. If I fall behind schedule with updates, I feel like I’m letting my readers down. That feeling motivates me to keep going and to post as soon as possible. Also, there’s something addictive about getting feedback for each chapter. The potential for engagement keeps me posting chapters, too. “But Briana,” you say, “I can’t post my first draft on the Internet!” Well, why not? If it’s because the prose isn’t perfect, don’t worry about it. Like I said before, the Wattpad community is incredibly positive. Moreover, putting up your first draft gives readers a peek into the writing process. A lot of people believe the prose is polished right when it flows out. When you post your rough draft, you’re showing everyone how much work it takes to turn the coal into a diamond. You’re letting them in on a secret. They’ll love you more for it. “Okay, but what if somebody steals what I’ve written?” I understand this concern because it’s one I also struggled with when I started posting; however, the reality is that stealing is highly unlikely. I’m not saying it’s impossible, but it’s hardly ever done. The same philosophy that applies to publishing applies to Wattpad, too – most people would rather come up with their own ideas than steal someone else’s and risk confrontation. As you can see, I’ve learned a lot from posting on Wattpad. Sometimes I doubt my decision, but on the whole, I’m happy with it. 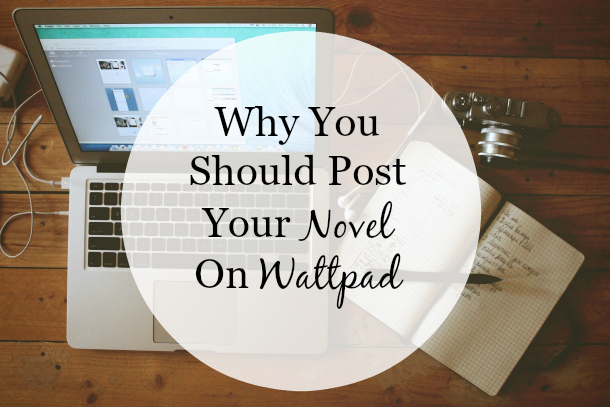 If you’re considering posting your novel to Wattpad, go ahead and take the plunge. I don’t think you’ll regret it. What do you think about Wattpad? What’s keeping you from posting your novel online? Leave your thoughts and answers in the comments below. I can’t deny one of the main reasons why I’ve never posted any of my original content for my stories online is because I’ve thought of people stealing my work. I’ve seen it done before several times in the fanfiction. But it’s nice to see the positive sides of posting up your work online. Hey you never know – these days online fiction is getting published too! 😉 Awesome post btw! I’ve never heard of Wattpad before- I’ll definitely have to try it! Every time I set up a profile on Whattpadd, I end up deleting it. I always worry about being considered “published” by an agent when I get round to the query stages! Wattpad is amazing. My sister and best friend are addicted to the fan fictions on that site. Though I’ve never really thought about writing here, I probably want to , by now. You should! I love it there! Excellent post. you almost have me convinced to join. I just gotta find some time. I think ELLA would do extraordinarily well on there. It’s different than a lot of stories on that site. It doesn’t work for everyone, unfortunately. I’m only hoping that people who read this post might be inclined to give it a try. I totally agree with you about the former part, too. Thanks for commenting! Definitely! I didn’t mean to sound too negative about it. It’s worth trying, especially since it’s free and relatively easy to set up.